Hayao Miyazaki’s Porco Rosso never saw theatrical release here in the United States, and since it was released after I left Japan, I had to wait 13 years to see it (when it was released on DVD in 2005). 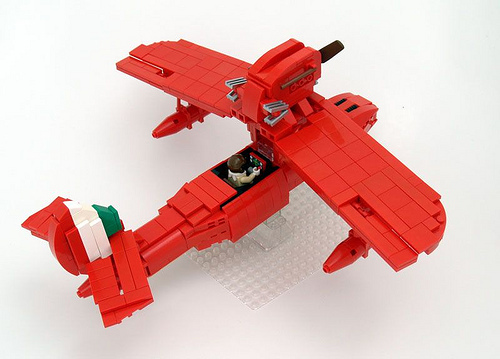 The movie was worth the wait, and I just love Uspez Morbo‘s interpretation of protagonist Porco Rosso’s seaplane. See lots more pictures on MOCPages, including the highly detailed cockpit (complete with foot pedals!). Great stuff. Great movie. This is an excellent model of Porco’s plane. I just love that movie. I created one of those myself a couple of years ago, but this is better.